10k Yellow Gold Polished 1.8mm Singapore Link Chain Necklace 16". Features: Polished - 10K Yellow gold - Lobster. If you have any questions about this product by Venture Gold Jewelry Collection, contact us by completing and submitting the form below. If you are looking for a specif part number, please include it with your message. 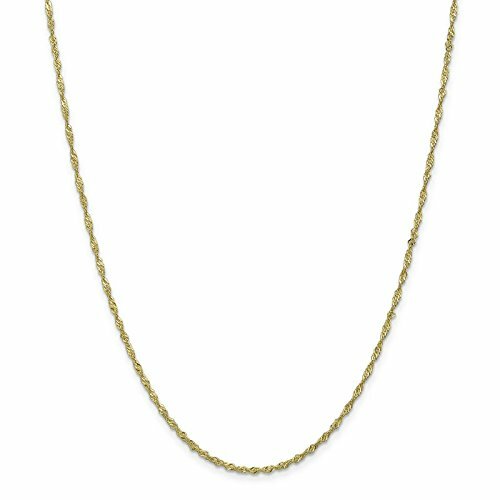 Solid 14k Yellow Gold 1.3mm Heavy Children Boy Girl Baby Kids Rope Chain Necklace - with Secure Lobster Lock Clasp 18"
14k White Gold 0.70mm Ocatagonal Snake Chain Necklace 30"